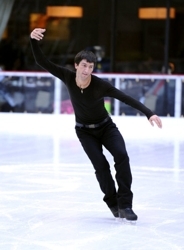 NEW YORK – January 6, 2011 – 2008 Olympic all-around gold medalist Nastia Liukin and 2010 Olympic figure skating gold medalist Evan Lysacek headline the “Progressive Skating and Gymnastics Spectacular” this Sunday at 4 p.m. ET from the Allen Event Center, in Allen, Texas (near Dallas). The show is a part of the Pandora NBC Skating Series, produced by Disson Skating in conjunction with NBC. Commentary will be provided by Peggy Fleming, Bart Connor, Nadia Comenici and Nastia Liukin. Joining Liukin on the gymnastics side is 2008 Olympic silver medalist Jonathan Horton, 2008 Olympic bronze medalist Raj Bhavsar and two-time World All-Around Champion Ivan Ivankov among others. Joining Lysacek on the ice are 2010 Olympic silver medalists Meryl Davis & Charlie White, 2010 U.S. champion Rachael Flatt and three-time National champion Michael Weiss among others. Providing music for the event is country music group Lonestar. The band’s musical legacy is tied to modern-day classics like “Amazed”, “I’m Already There”, “Come Cryin’ To Me”, and “My Front Porch Looking In”. In 1999, Lonestar achieved crossover success when their hit single, “Amazed”, reached No.1 on both the country charts and the Billboard Hot 100. This entry was posted on Thursday, January 6th, 2011 at 5:17 pm	and is filed under Celebrity Bites, Celebrity Gossip, Celebrity News, Celebrity News & Juice, Dancing With The Stars, Events and Nightlife, Music Scene, News, Ramblings On Current News & Events, TV's Picks & Pans. You can follow any responses to this entry through the RSS 2.0 feed. Both comments and pings are currently closed.